A Brown Bathroom decorating theme is perfect for a more neutral or masculine theme. 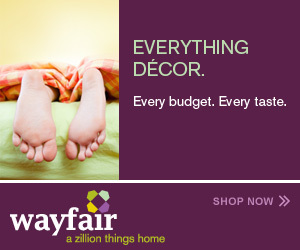 Bachelors or Teen boys would much prefer this color scheme over any other color as it seems to just say ‘male’. There are some great design choices available for using brown in bathrooms and they don’t have to be completely masculine in style either. You can create a space that is just as pretty as a blue or yellow one, but with the neutral earth tones that you love. Scroll down to find the perfect items to suit your style. 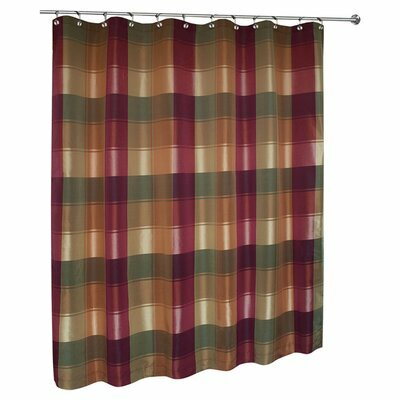 Using a geometric pattern in the shower curtain and towels like the one shown above is one fun way to use brown in the bathroom. It has a nice contemporary feel to it along with fitting a retro style of home. I like the use of the different shades of blue which also would appeal to the males of the house. 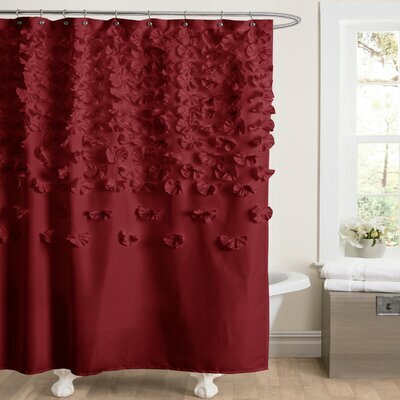 The fun thing about this design for the shower curtain is that there are also options for wall decals and even wallpaper borders. 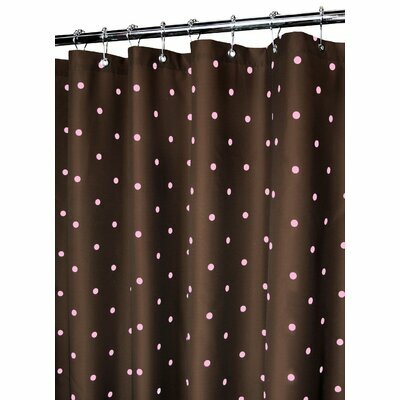 Add a little more femininity to the bathroom and still use brown by choosing polka dots like the shower curtain above. It isn’t too frilly for the guys of the house and still has a touch of female with the pretty pink dots. Combine a combination of pink and brown accessories like towels and vanity items and the entire room pulls together nicely. You can not get more down to earth than the color brown so it is associated with stability. It gives the feeling of providing protection to the family and a sense of belonging to a unit. It is also a practical color to use because it can blend so nicely with so many other members of the color wheel. People get the sense of having both feet firmly planted on the ground when using this color. Subconsciously we think of reliability and the security of the materials we have due to hard work. It provides us with a calmness that many other colors do not. Because it is the color of the earth we often think of the great outdoors and nature in general when surrounded by brown or at least touches of it. So many colors work well with brown so use your favorites combined with this earthy tone to make that bathroom look great and match your own personality. Using the color red in the tone of burgundy in a bathroom is so bold and bright that you can’t help but feel empowered just walking into one. Burgundy gives the feeling of energy and also passion. You can use a little of this wine colored red or a lot of it. It works so well with other colors that you can use it as the main color or as an accent color. 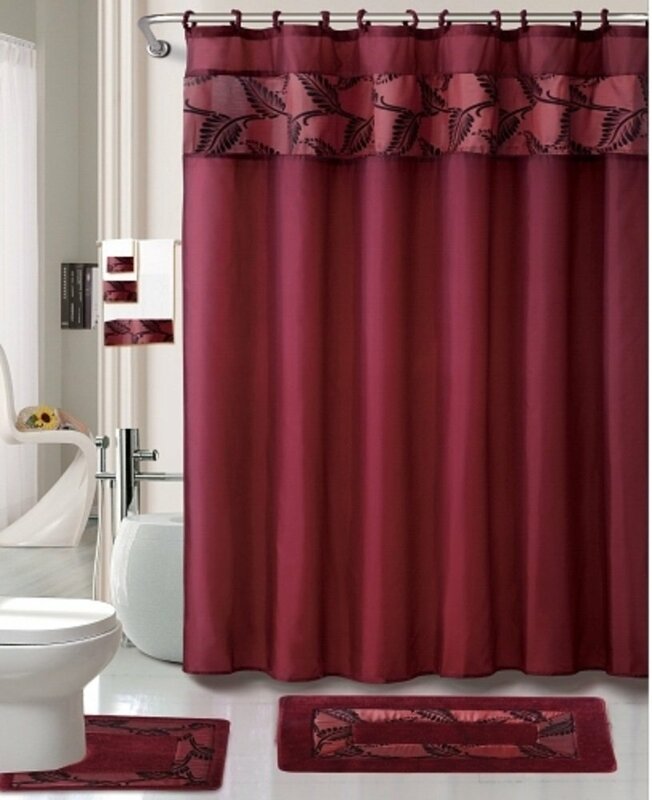 If this wine red known as burgundy is to be the main color in your powder room or master bath you will want to choose a coordinating set of shower curtain, bath mats and large items that show your passion for this bold color. If you are wanting it to be an accent color then having accessories for the sink or vanity will do the job, nicely. I have compiled a list of the most interesting choices on the market today for you to start your new decorating scheme using dark red or burgundy in the bath. pay attention to the hue of your red. Some have a blue tone while others have a yellow tone. They look best when staying in the same family (blue or yellow). They don’t mix well, however. What colors go with burgundy red? As I mentioned above, not all reds blend well together so make sure the red items that you choose are either all in a blue tone or a yellow tone. Do you want the bathroom to have a unisex look, a masculine look or do you want to go with a feminine touch? The answer to that question is going to determine what kinds of pieces that you will use. Well, we have the basics like shower curtain, rugs, and towel sets plus any pieces that may decorate and function on the sink vanity but the “look” you want to achieve is going to determine what style of items you will chose. 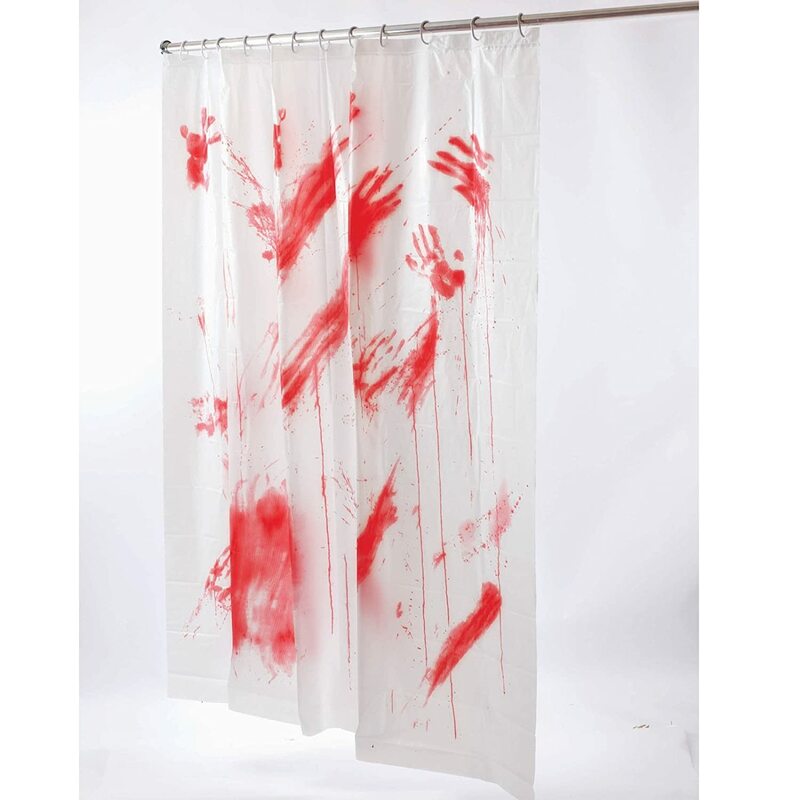 Now just imagine the fun things that you can get that will go with a feminine shower curtain like that! I would be tempted to use a few shades of pink for the sink vanity accessories with this one. Burgundy in this shade of red will look awesome with pinks. This is such a fun style for a bath that wants a manly feel to it! Imagine the colors you can work with this one! Greens, browns and golds will go nicely. Heck, I would even consider some bronze colored items to go with it. My recommendation is choose the style you want first and then start shopping for the accessories in the dark shade of red called burgundy. Keep the colors in the blue hues or yellow hues and have fun with it. 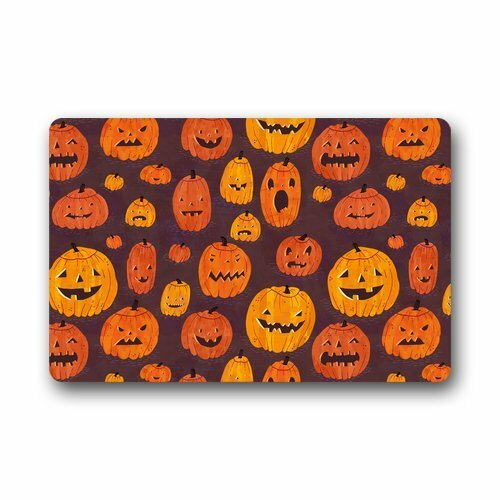 Have you thought about the things you want to use in the house for decorating for Halloween? Don’t forget the bathroom for those decorations. Think that might be hard to do? I am here to tell you that it is not hard at all. 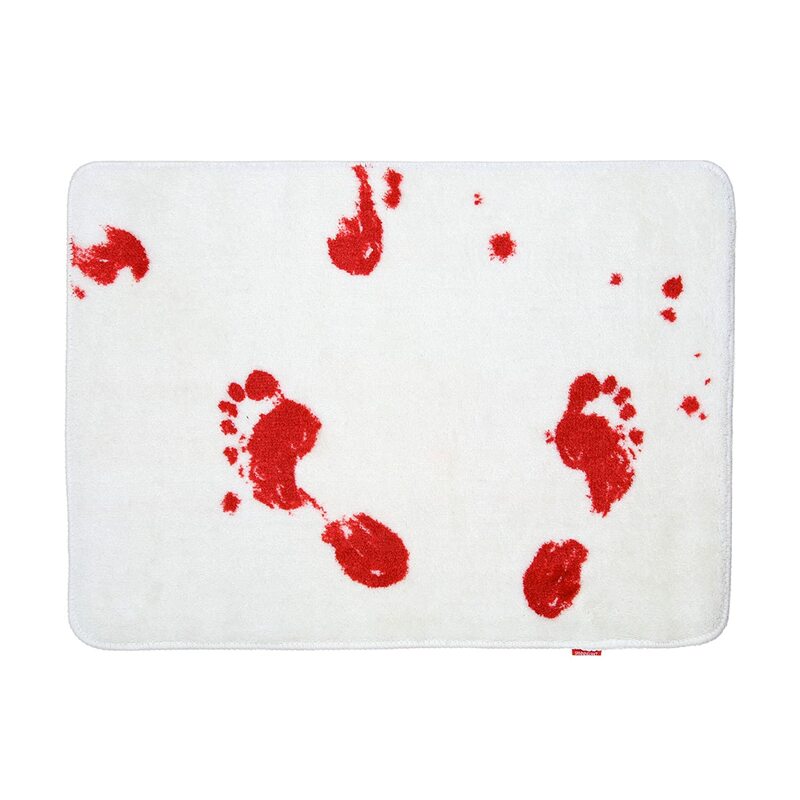 There some fun things that can be used in any bathroom to show your love for this October holiday! There is not much very scary about Jack O’ Lanterns at Halloween. Well not as frightening as ghosts, goblins and skeletons that is for sure. If you just want something decorative that will liven up the “throne room” then some cute little pumpkins will work just fine. 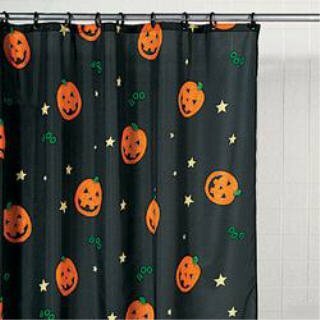 See how easy it is to transform the bathroom into a cute little Halloween Haven? It Could Be A Blood Bath! 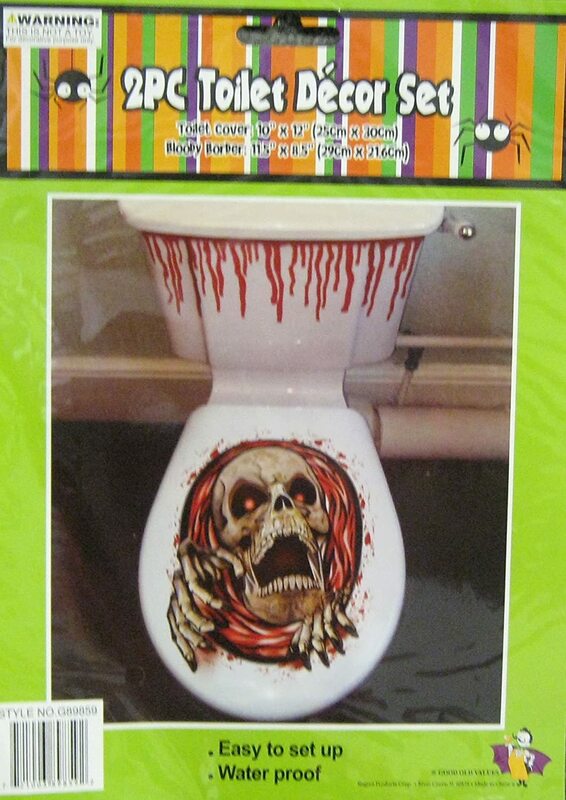 I just could not resist this line of decorations for a Halloween Bathroom! They actually made me chuckle when I thought of the term a real blood bath! Kind of makes ya think of that old scary movie Psycho doesn’t it? They really are kind of fun, I think. There is even a shower gel that looks like a intravenous bag with blood colored soap! 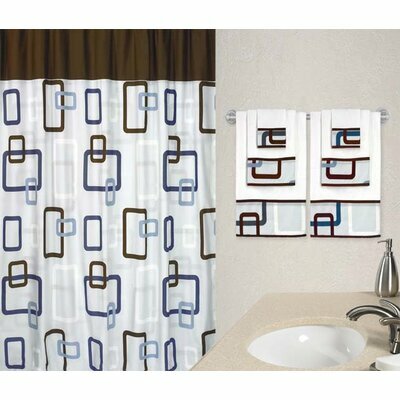 Even if you didn’t use the gel and just had it hanging in the shower it would be a fun decoration! I saw a hand towel set, too. It has a bloody hand print on it. I am not going to bore you with a bunch of links to products but I think with the ones that I have given you can get a general idea of some fun things to decorate the bathroom with. You can go spooky or not so spooky, it is your choice. 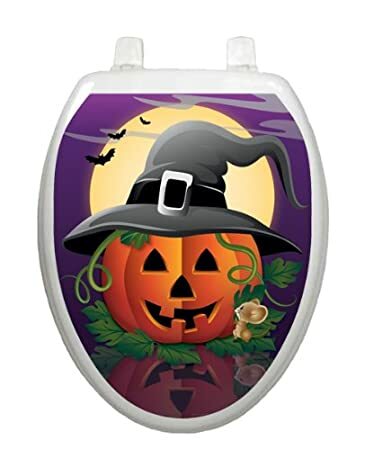 I did see some fun Toilet Tattoos (decals for the toilet seat) that had a Halloween theme. 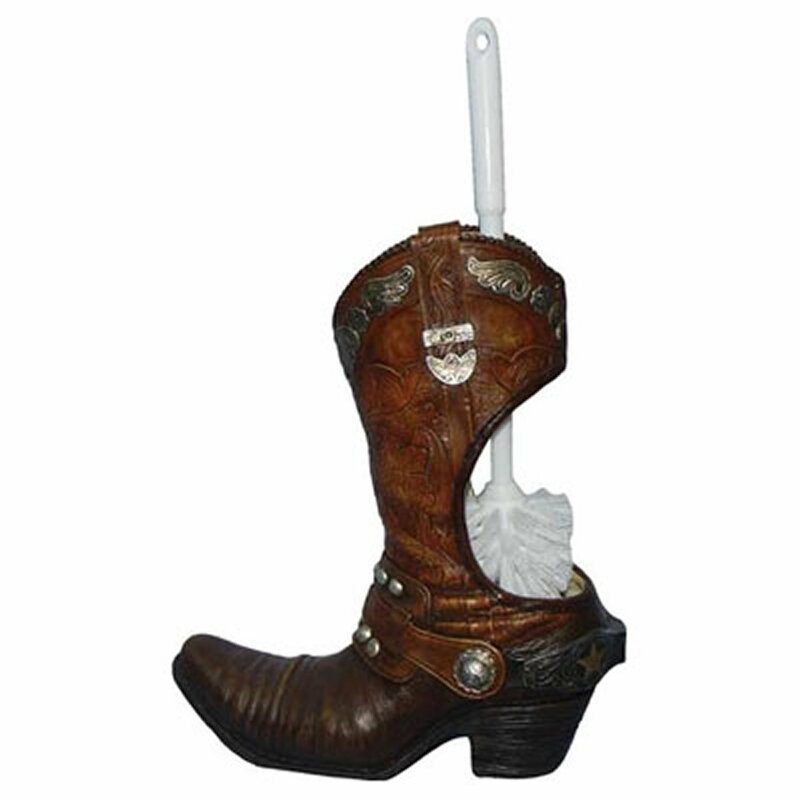 Some fun toilet brush holders and soap dispensers with the holiday decor in mind. 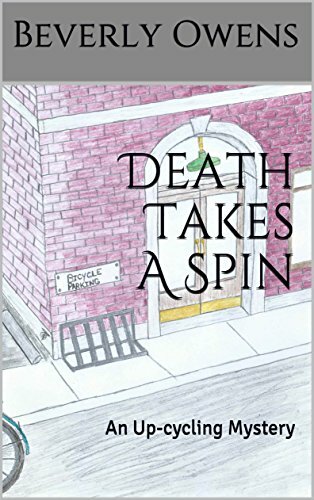 There are even some covers that you can put on the door that have a Halloween theme: a skeleton sitting on the “throne”, a pirate doing the same thing and a few other funny ones. I think the main thing is to decide on a theme and then work around it adding items that you can purchase, use and then pack away for next year. And then create some of your own items that will go with your theme. 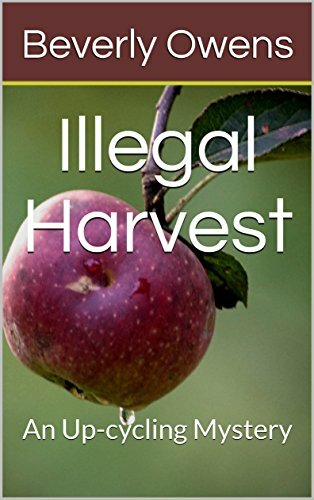 Start keeping your eyes peeled for this type of thing because even though I am writing this post in August the stores are starting to put the decorations out for the October holiday that has become almost as popular to decorate for as Christmas is. As a kid many of the shows that were regular viewing in our home were the old westerns so I think that may be one reason that I have always had this “thing” about a cowboy. I know I am not alone in this as western stuff in general is gaining in popularity. 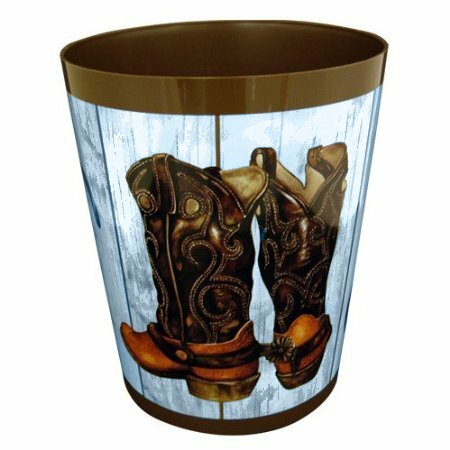 So, today I thought it might be fun to look at some ideas for decorating a cowboy boot bathroom. One with this theme would look great in a rustic home, log cabin or lodge decor. Heck, I think it would be gall darned cool in any house, but that is just me. 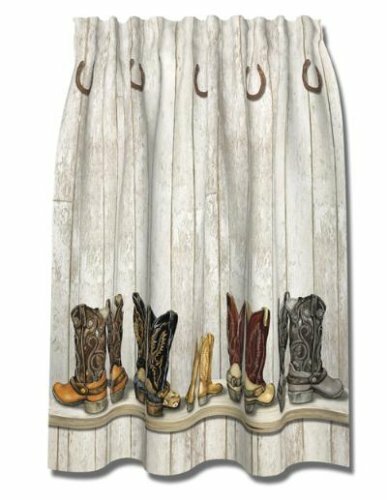 I saw this the other day when I was actually shopping for something else and I just think it is perfect for a bathroom decorated with a cowboy boot theme. 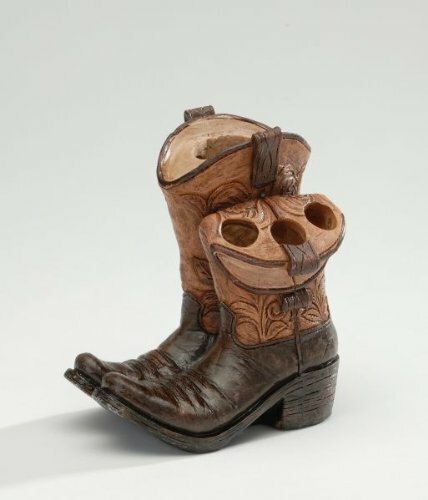 I do love my own cowboy boots so it is no wonder this caught my eye. Of course you would not have to use the paneling but it does give a more old west kind of look to the room. For floors, I think a dark brown tile would look great. I am not a fan of having carpeting in a bathroom because I always worry about the possibility of mold growing in the fibers due to the damp atmosphere from showering every day. I would go with a ceramic tile if the budget allows or the vinyl tiles that you can install yourself would look just as good and be much cheaper. Add some towels in the colors of the boots and you have a fun and unique bathroom to enjoy. So what do you think? 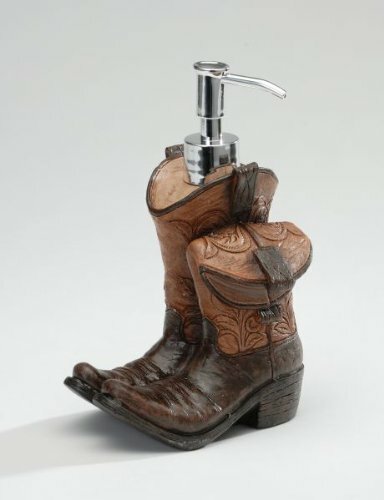 Is this a bathroom idea that makes you want to put your dancin’ boots on for?